The objective of the Jean Monnet Chair on EU Environmental Law (Project: 587220-EPP-1-2017-1-ES-EPPJMO-CHAIR) is to ameliorate participants’ competences in European legal studies from the EU internal and external dual dimensions. The Chair’s activities will help the target audiences to develop their learning capacities in order to take on the challenges facing the EU in its attempts to achieve sustainable, fair and resilient environmental governance. This objective will be achieved through four annual intensive courses, three seminars and one training course, a research project, a series of specialized workshops and lectures and a final conference. 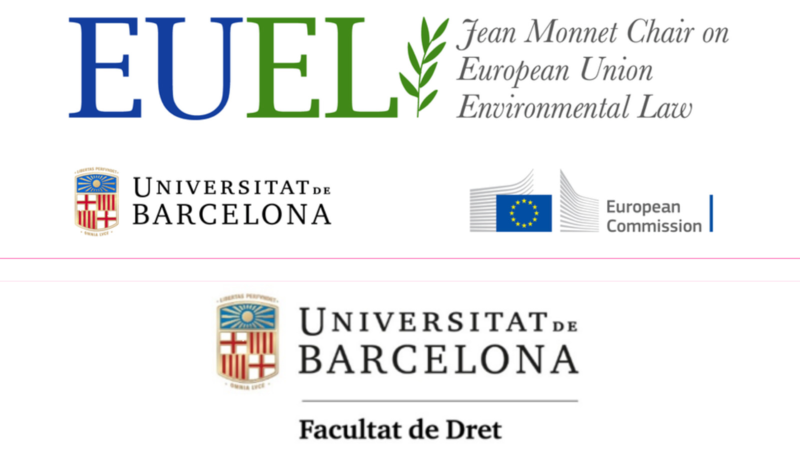 Besides, the close cooperation with the Tarragona Center for Environmental Law (CEDAT) at the Rovira i Virgili University (URV) and the UB Water Research Institute (IdRA) as well as the interaction with international, national and local organizations concerned will help to achieve this objective. Awareness around environmental protection related to public policies, as well as the consolidation of concepts such “sustainable development” or “environmental justice” has generated important political and social effects that require structural changes in government, and rethinking of many components of our economic model. By its very nature, both the legal system and the economic current model are largely determined by the EU policy-maker. Consequently, there is a need of qualified legal professionals who can advise governmental bodies as well as corporations and environmental NGOs. The Chair’s activities will help future professionals to develop their critical thinking capacities and their knowledge in the field it intends to cover. The Chair also provides teaching to students from other backgrounds and extends the learning activity to groups of audiences with other social science backgrounds. Indeed, the Chair also focuses in audiences who do not automatically come into contact with EU Studies and that will benefit from the EU legal knowledge beyond their immediate expertise. The Chair also conducts research on EU subjects, based on the previous scientific relationship of the key staff and in their academic research paths. The Chair is also expected to train scholars and Ph.D. candidates to conduct independent research on EU environmental studies. Finally, the Chair also organizes activities targeting policy makers at local, regional and national level as well as civil society to help them to acquire the necessary knowledge about the various challenges the EU environmental policy faces.